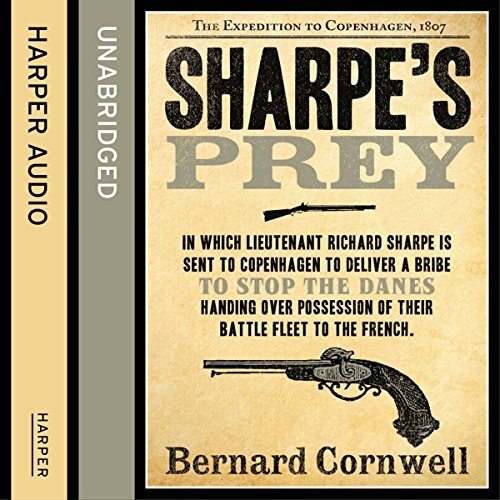 Richard Sharpe is sent to Copenhagen to deliver a bribe to stop the Danes handing over possession of their battle fleet to the French. It seems very easy. But nothing is easy in a Europe stirred by French ambitions. The Danes possess a battle fleet that could replace every ship the French lost at Trafalgar, and Napoleon's forces are gathering to take it. The British have to stop them, while the Danes insist on remaining neutral. Dragged into a war of spies and brutality, Sharpe finds that he is a sacrificial pawn. But pawns can sometimes change the game, and Sharpe makes his own rules. When he discovers a traitor in his midst, he becomes a hunter in a city besieged by British troops. The perforfance is fine, the location is great, there's a tragic historical context, but the new characters are stereotypes and the plot is more filler than compelling. I guess Cornwell had to get Sharpe out of his happy home and feature Copenhagen as a step in Wellington's career, but the story was a bit of a muddle.